It’s almost SPRING! Well, here in Chicago it could feel like spring temperatures one day, and the next it could snow. BUT, the idea of Spring is all it takes for me to want to whip up a batch of Lemon Cupcakes! Anything lemon flavored actually. I think that fresh, bright lemon reminds me of sunshine! 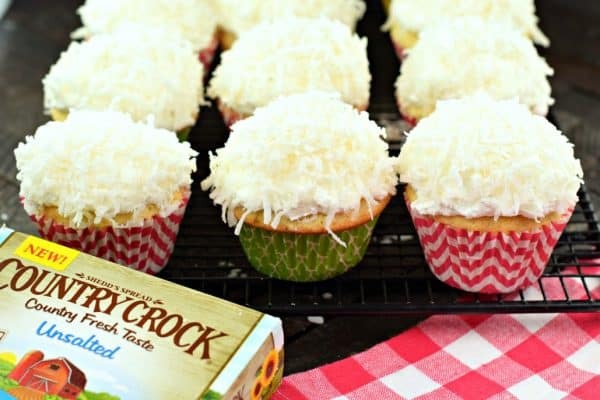 Today, I’m making a Lemon Curd filled cupcake with a sweet Lemon Frosting topped with Coconut. It’s basically screaming, it’s EASTER, it’s EASTER! Easter traditions at our house always include a ham dinner and a festive treat to finish the meal. 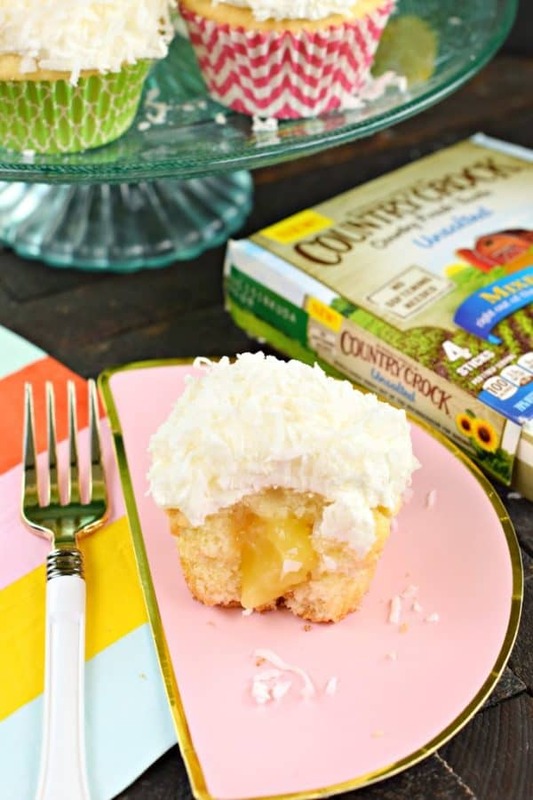 Normally I choose a version of one of my carrot cakes, but when Country Crock® reached out asking me to try Stefani’s Lemon Curd cupcakes, I happily obliged! In addition to sending me the recipe, I also received a basket filled with all sort of baking goodies and a few packages of the new Country Crock® Buttery Sticks. Have you tried these yet? They are a baker’s dream come true! They don’t need to be softened. It’s amazing. You just grab them straight out of the refrigerator and make cupcakes, frosting, cookies, etc. NO SOFTENING needed. What a time saver! 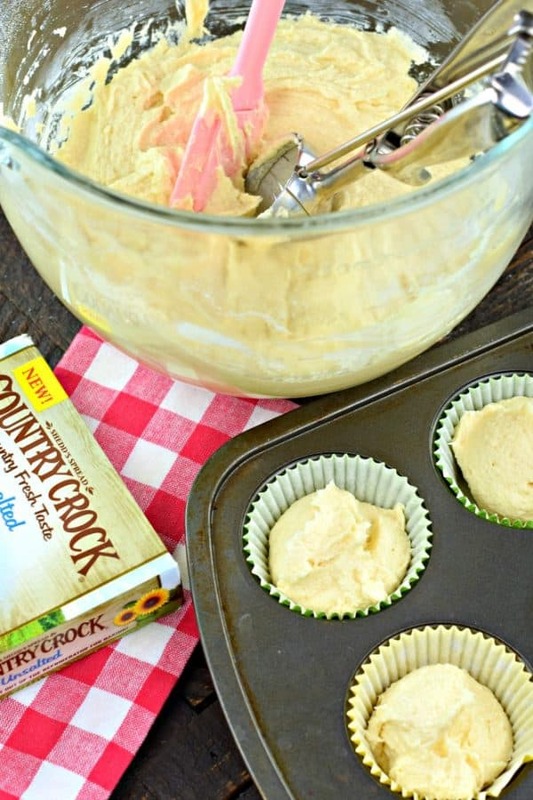 Country Crock® Buttery Sticks are made with sunflower oil, have a soft and creamy texture, and a fresh taste! You can use them like butter in all your favorite recipes, in a one for one exchange! I can’t wait to try them in some of my favorite cookie recipes! Start with your dry ingredients mixed in a bowl. Add your Country Crock® Buttery Sticks and beat for several minutes until fully blended (and remember, they don’t need to be softened first)! Add your wet ingredients and beat until creamy. 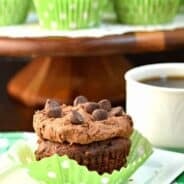 Fill your favorite colorful cupcake liners and bake for about 18-20 minutes. The recipe makes about 12-15 cupcakes. Once your cupcakes have cooked and cooled, you’ll want to fill them with lemon curd. 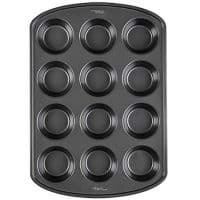 The easiest way to do this is to cut a small circle around the middle of the top of each cupcake, going down 3/4 of the way into the cupcake creating small cylinders. Remove cylinders of cupcake and set aside. Spoon about 1 Tbsp of lemon curd (you can purchase this or make my homemade Lemon Curd recipe), and place the cylinders back on top of the cupcake. It’s okay of they don’t fit perfectly as you’ll be covering them with frosting. 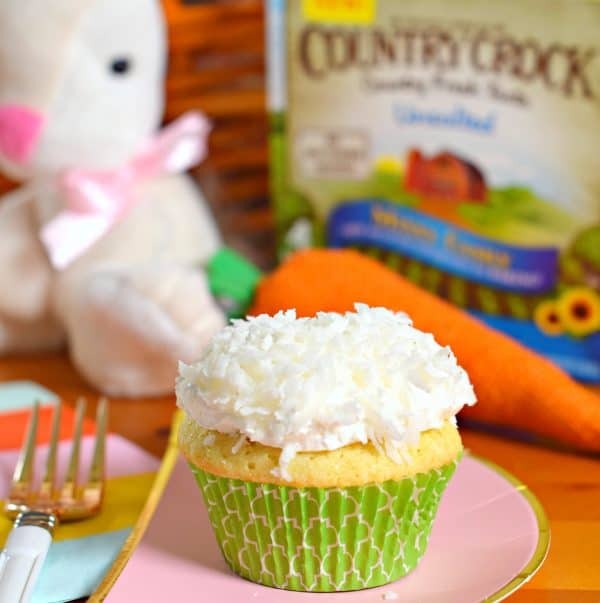 For the frosting, beat the Country Crock® Buttery Sticks until light and fluffy (about 2 minutes). Add in powdered sugar, milk, and lemon extract and beat for an additional 3-5 minutes until creamy and fluffy. I used a cookie scoop to top each cupcake with the frosting. 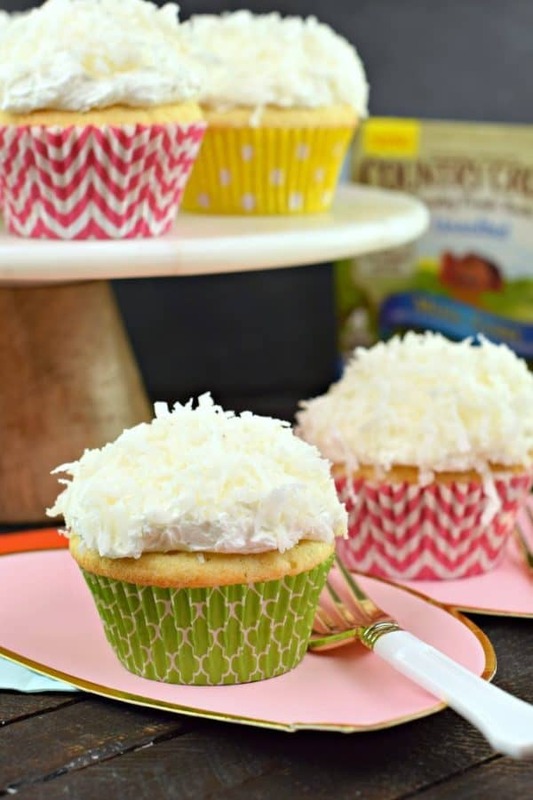 Spread evenly over the top and add the sweetened, shredded coconut to each cupcake, pressing gently so it sticks to the frosting. 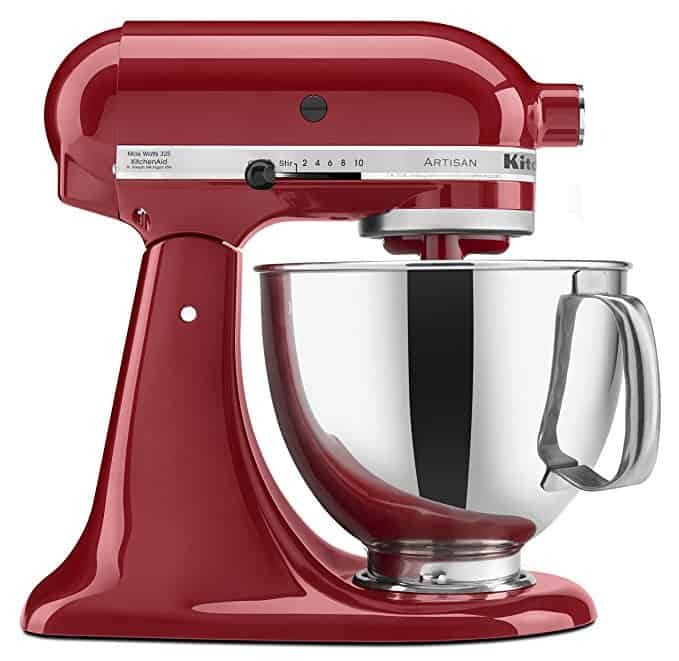 What’s on your baking list for Easter? Whether you try these or not, be sure to pick up some of the Country Crock® Buttery Sticks. I think you might fall in love with using them, as a quick and delicious alternative to butter! Preheat oven to 350°F. Line cupcake tin with paper cupcake liners. Set aside. 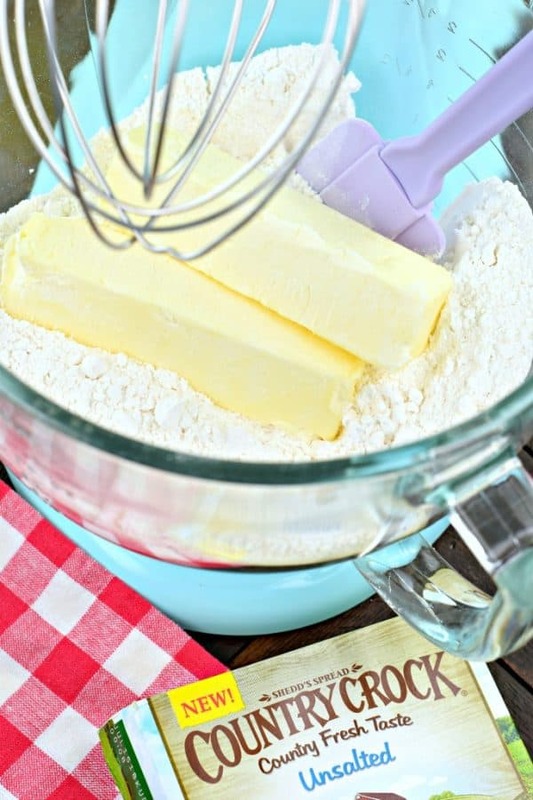 In a mixing bowl, combine sugar, cake flour, baking soda, baking powder, and salt. Add in Buttery Sticks, and mix on medium speed for 2-3 minutes until well blended. Set aside. In a small bowl, whisk together the eggs, ricotta cheese, vanilla and milk. Add egg mixture to flour mixture and beat on medium until smooth and combined. Fill cupcake liners about 2/3 full. Bake for 18-20 minutes and remove to cooling rack when done. Cool completely before adding lemon curd and frosting. When cool, cut a small circle around the middle of the top of each cupcake, going down about 3/4 of the way into the cupcake creating small cylinders. Remove the cylinders and set aside. 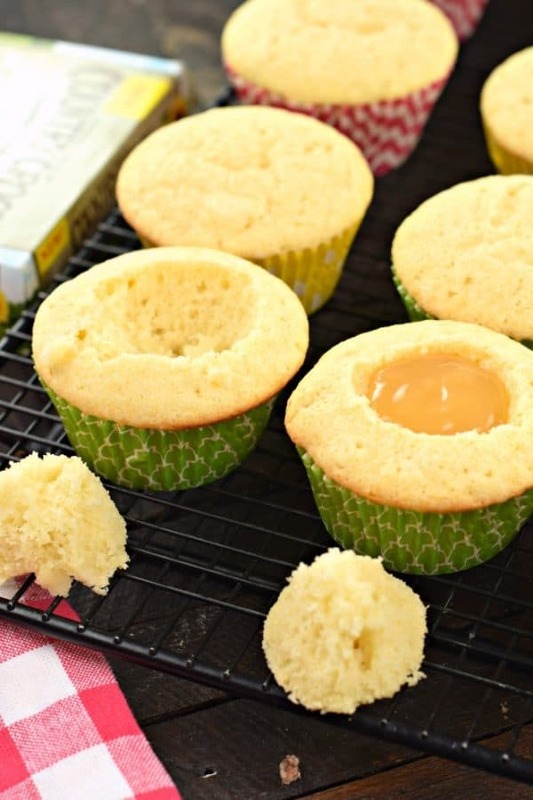 Fill each cupcake with 1 Tbsp of lemon curd. Press the cylinders lightly on top of each cupcake. Don't worry if they don't fit perfectly as you will be adding frosting to the top! For the frosting, beat Buttery Sticks until light and fluffy, about two minutes. Add in powdered sugar, milk, and lemon extract. Beat for an additional 3-5 minutes, scraping down the sides of the bowl as needed. 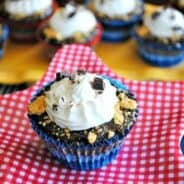 Use a 2 Tbsp cookie scoop to top each cupcake with frosting. 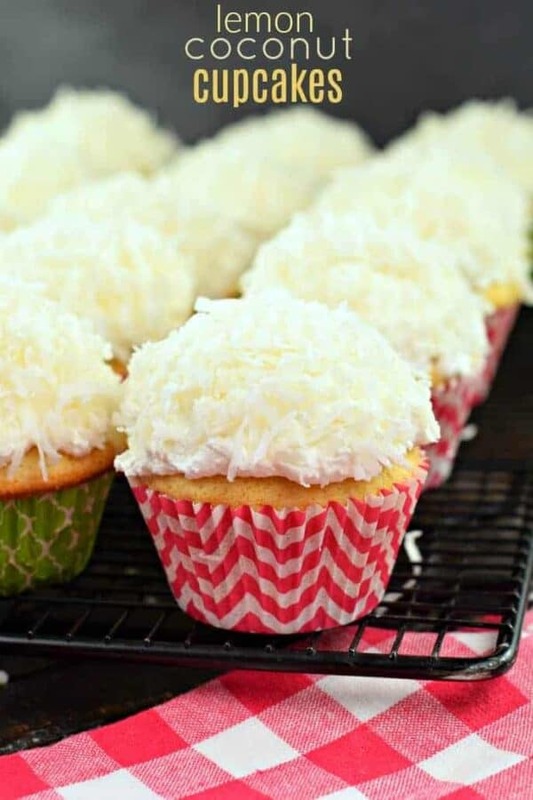 Spread evenly over the top and immediately press the coconut into the frosting, gently. Store in covered container in the refrigerator until ready to eat, and enjoy! I love the filling! These look so delicious! Lemon curd is the BEST! 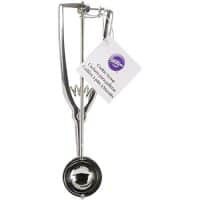 I love that the buttery sticks can be used right away, that makes baking so much easier! 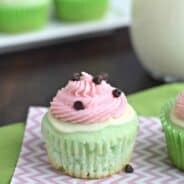 Lemon is one of my favorite flavors for Spring and cupcakes are always a great idea! We love lemon curd, so these would be a hit at my house. I’ll have to give the Country Crock sticks a try. 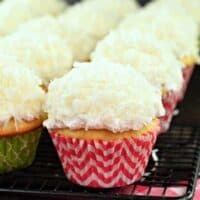 The recipe for Lemon Coconut cupcakes does not give an amount for the Buttery sticks. Please let me know.